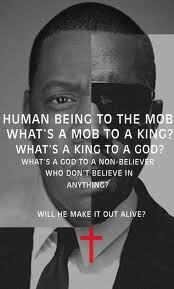 Rappers Jay-Z and Kanye West released a single along with Frank Ocean a few years ago called “No Church In The Wild.” The song claimed the irrelevance of God to a people who don’t believe in anything. I heard many Christians talk about the nature of the song promoting atheism, rebellion or other fears to be concerned about. I heard it more so as a call for Christians to stand up and get back into their rightful place in the world…or should I say the wild. Before a person meets Jesus and surrenders their life to Him, they were in the wild. We all were wild. No one was saved all their lives. For some reason as people become sanctified in Church, they lose touch with their “wild side” and become unaware of how to relate with unbelievers. While God saves us and changes our lives, He also calls us to GO into ALL the world (wild) and preach the gospel. The gospel is the good news of what God did for you and what He wants to do for others through you. Jesus is building His Church in the Wild. We were not designed to be far from the wild. We exist for the wild. The Church has become tamed. If the definition of wild as stated above means not cultivated or tamed, then the Church must become untamed in order to reach the world God died for. The Church has become safe. Tamed. We need to untame our idea of God. A fire cannot be tamed and our God is a consuming fire. The problem: Believers were trained and taught outside of God’s Heart. Our faulty view of God hinder our ability to reach the lost. Love. Forgiveness. Hope. Grace. Honor. Encouragement. That’s His heart. Perhaps we are trying to build a Church the wild will come to. How about BEING a church the wild will come to, for the Church is not a building but a people. Better yet, let’s not wait for them to come, let’s meet them where they are! In January 2013 At Hungry 4 God Church, we are preparing our people to go on mission to be a Church in the WIld. In order to do so, we are going into communities as Tribes, small groups encouraging people to connect with us in order to discover God, His Son and His Love. We believe our call to build tribes, churches in the wild, will capture the hearts of many looking for God but afraid of Church. Tribes in parks. Tribes in bars. Tribes in coffee shops. Tribes in homes. Tribes in businesses. Tribes on college campuses. Tribes in libraries. Wherever people are, we want a tribe there. A bit risky? sure. But that’s what being wild is all about. Let the fun begin! Question: Do you think the Church is losing relevance or influence in this generation? If so, what do you believe will fix it?? Let the round up begin! Thanks for pinging…You are a gifted writer! fromm you. That is really a wonderful web site.